On Feb. 13th, SBMI will host the second annual Health Technology & Policy Speaker Series sponsored by Vorys. This year, SBMI will host Walter Suarez, M.D., M.P.H., from Kaiser Permanente International. Dr. Suarez is among the nation’s leading health services researchers and is a thought-leader in health informatics and policy. 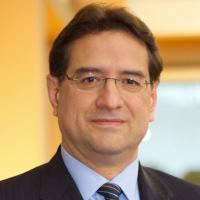 Dr. Suarez will speak on moving U.S. Health Care Beyond EHRs, Meaningful Use, and Interoperability. We hope everyone had a lovely and healthy holiday season. We want to welcome back all returning SBMI students. To all new SBMI students, we are very happy to have you join the SBMI community here at UTHealth. We are looking forward to a successful spring semester. The spring 2018 semester started on Jan. 8, 2018 and class add/drop via MyUTH ended Jan. 24. Please refer to the academic calendar for other important dates as well as events including local conferences and TMC Library workshops. Courses offered this semester as well as classroom information can be found on the semester schedule page. Amy Taylor and Travis Holder are the liaison librarians for SBMI at the TMC Library. Beginning Tuesday January 30th, they will hold office hours every Tuesday from 1 to 5 p.m. at UCT Room 1410. Students and faculty are welcome to set up an appointment or just meet with them on a walk-in basis. Amy and Travis can also meet with SBMI users online via GoToMeeting. Amy Taylor is the UTHealth liaison librarian for the Texas Medical Center library. She has previously been the reference and instruction librarian for the UT School of Public Health, and has also worked in public libraries, large academic libraries, community college libraries, and an archival special collection. Amy enjoys creating searches and helping others to meet their research goals. Contact Amy at 713.799.7184 or taylor@library.tmc.edu. Travis has been working in libraries since 2010. He enjoys research and helping others to find the information they need. His areas of interest are database searching, ethics and scholarly communications. You can reach Travis at 713-799-7166 or holder@library.tmc.edu. Associate Professor & Alumna Juliana Brixey, Ph.D., MPH, RN had an abstract accepted for the 4th Biennial STTI European Conference late last year. The conference will take place in Cambridge over the summer and Dr. Brixey, along with four co-authors, will present an oral paper. Professor Dean Sittig, Ph.D. was interviewed for a Healio news story earlier this month. Feb. 13 Update on UT Physicians Informatics – Ryan Walsh, M.D.